We offer you in our café and restaurant “Postillion”. Enjoy best bavarian and mediterranean cuisine and get surprised by our own food creations! On cold winter days we serve you hot coffe and homemade cakes in front of the fire place. White-blue and cosy is the atmosphere on our big sunny terrace. Enjoy your meals under the bavarian sky and admire the beautiful view on many sunny days all year long into the surrounding mountains! Our Restaurant / Café is closed on 24th December 2018. Enjoy bavarian hospitality in our restaurant “Wuiderer”! 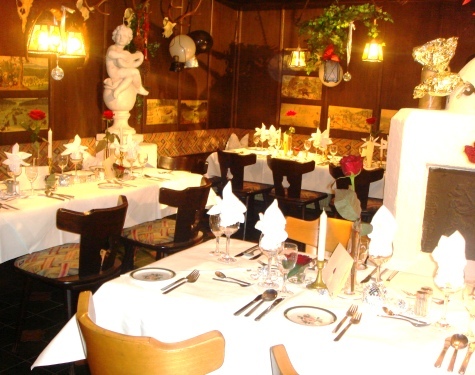 we offer our cosy restaurant “Zum Wuiderer” in the basement of our house. In between deer trophies and target plates you can sing, dance, drink, eat and party. According to that we offer you a great variety of Drinks, famous wines and many local and international cuisine in our restaurant “Wuiderer”. What it makes so unique is first of all the decent and elegant interior in our “Wuiderer” but also our beer garden in the summer outside and special arrangements for your birthdays, weddings or any occasion to celebrate.